This three-storeyed restaurant is something of a landmark in the vast warren of Noida’s pre-eminent shopping market. 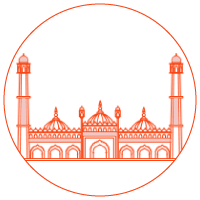 It was one of the very first eateries to be set up when Sector 18 was brand new. Visited by office groups from the neighbouring companies at lunch time and families at dinner time, the menu is full of tried-and-tested favourites. In deference to their customers, old favourites like Shredded Lamb in Hot Garlic Sauce and Pan-Fried Eggplant with Guillin Chilli are mainstays on the menu. Occasionally, the wear and tear of the décor shows through, but that doesn’t trouble the punters. We had visited Bamboo Shoots almost a decade back. For some reason, the repeat visit was not happening. When finally it did, it felt like nothing had changed. Well, something had - the decor! They were in the process of renovating, giving the place a cafe feel. But the taste & service remain the same. We had House Special Chili Garlic Noodles & Kung Pao Chicken, both of which were tasty. With our rum, we wanted Thumbs up which they did not have. But seeing our disappointment, they sent someone to fetch it from outside. Wow! Bamboo Shoots used to be a good Chinese restaurant. After renovation it has added Asian cuisine also. Ambience now is not very impressive. Pad Thai noodles were bad. Staff is courteous though. They didn’t charge for pad Thai noodles and were ready to replace it too. In India, most of the Chinese food is the Indianized version, with an added emphasis on chillies and masala and gravy. This restaurant has some decent dishes but totally overpriced for India. I would choose this over most other Chinese in the area just because the quality of Chinese food in India leaves a lot to be desired. Service and Ambience has become bad! Bamboo Shoots used to be a very good restaurant, especially their basement section. Recently they have started renovating. We went for a dinner and were shocked to see the new ambience which looked like a typical English cafe, instead of a good rich ambience. The price is still at a higher side although the ambience does not complement the same. The gentry coming in the restaurant does not expect loud music, we had to ask them to switch it off or lower the volume many times. A light non-lyrical music may complement. This restaurant totally disappointed me. The decor is pedestrian and the food even more so. The price however touches the sky. Their portions are ridiculously small. You may remember what the glittery lanes of Noida looks like today, but almost a decade ago the scene was not so exciting. All it was a dusty stretch of land with few decent showrooms along the side of the road and the famous Sector 18 trying to turn a new leaf. The busy Atta Market which now can be a hip spot for the A-lister crowd was earlier nothing better than a cluster of unpretentious looking shops. 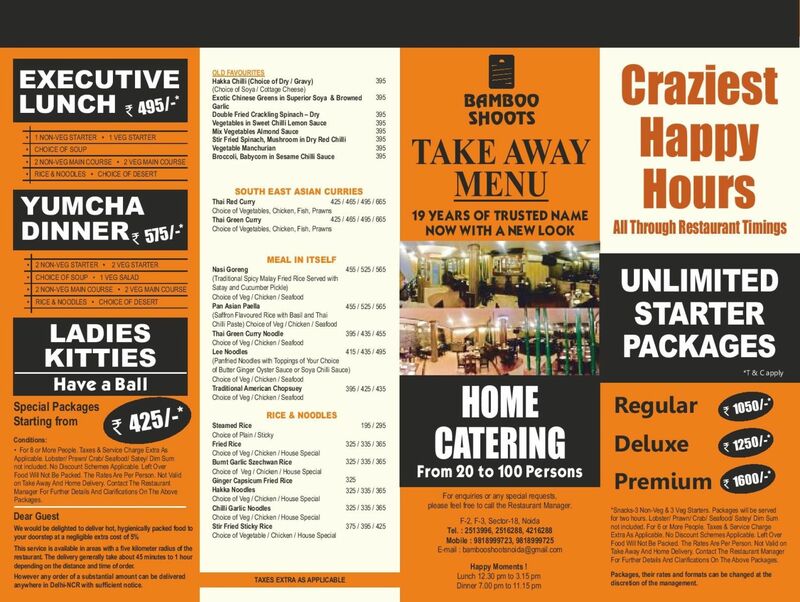 The change in gastronomy came with the arrival of â€˜Bamboo Shootsâ€™, which was one of the first family dining restaurants to open in Sector 18 of Noida. The restaurant gained popularity almost overnight due to its superb Pan Asian menu and a simple pleasing interiors that seemed to draw the punters in hordes. It still is one of the best and pocket-friendly places to have Pan Asian food in Noida. The menu of Bamboo Shoots is its backbone and is the reason as to why the restaurant has managed to survive this long. 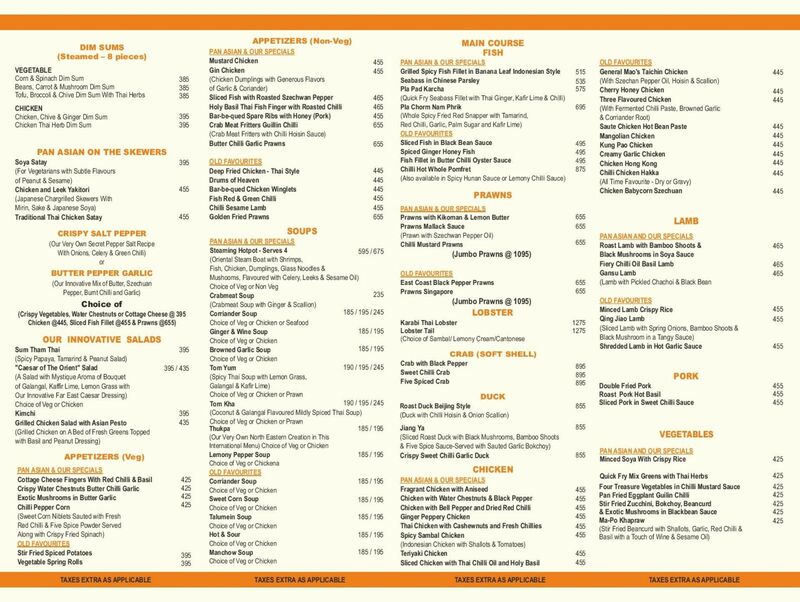 You can dig into the menu to savour the Pan Asian cuisine in an exciting way with some feel good classic dishes still making noise. A wonderful variety of seafood is up on display so be ready to indulge and spoil yourself. Foray into the menu with, butter chilli garlic prawns, soya satay, drums of heaven, chicken & leek yakitori, bar-be-qued chicken winglets, dim sums, chilli pepper corn, sum tham thai, talumein soup and crab meat fritters guillin chilli. The variety is endless. Main course entails, fiery chilli oil basil lamb, prawns mallack sauce, pla pad karcha, chilli hot whole pomfret, cherry honey chicken, vegetables in sweet chilli lemon sauce and Pan Asian paella. Bamboo Shoots is a popular spot for kitty parties and executive lunches and if informed before, the staff will help you put together a wonderfully crafted menu. The menu in turn is classic and innovative at the same time. At Bamboo Shoots the focus remains on the food not the interiors, although the interiors are not bad in itself. The setting in informal and remains the same as it was years ago. The patina of age shows on the dÃ©cor but the punters still love it just the way it is. Bamboo Shoots is casual, family-oriented, pleasing, old fashioned and very very delicious. If you crave for Pan Asian food there is no place better than Bamboo Shoots.